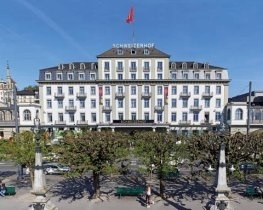 Award-winning Art Deco Hotel Montana enjoys stunning views over Lake Lucerne from its hillside setting only a short walk from the city centre and linked to the lakeside by a short funicular ride. Dating back to 1910 the hotel has been tastefully renovated in a contemporary art deco style with individually designed guest rooms and suites; choose a lakeside room with balcony for spectacular vistas. Acclaimed fine dining restaurant Scala features creative Mediterranean-inspired cuisine and during warm days guests can choose to dine on the outdoor terrace. The Kitchen Club offers a chef’s table concept and the rooftop Beach Club, complete with whirlpool, is perfect for cocktails and delicious snacks. Boasting a precious collection of whisky the legendary Louis Bar is a hotspot for live jazz, whilst for rum and cigar aficionados there’s the Hemingway Rum Lounge and for those in need of some pampering and relaxation, a day spa. Double rooms with wonderful views over the hillside offer a comfortable and stylish setting in which to stay. Individually decorated, the rooms feature a queen or king size bed (or twin beds if preferred), chairs, writing desk, modern bathrooms with a bath or shower, and some rooms enjoy a balcony. Added comforts include a television, Suitepad containing a selection of e-newspapers and e-magazines, and a Bose sound system. 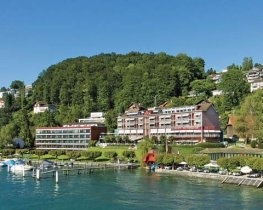 Double rooms with charming views over Lake Lucerne offer a bright and stylish setting in which to stay. Individually decorated, the rooms feature a queen or king size bed (or twin beds if preferred), chairs, writing desk, modern bathrooms with a bath or shower, and a balcony overlooking the lake and mountains. Added comforts include a television, Suitepad containing a selection of e-newspapers and e-magazines, and a Bose sound system.